You are flying a heading of 055 when you are issued this clearance: "...hold east of the ABC VORTAC on the zero niner zero radial, left turns..."
Such a clearance is enough to induce a rapid heartbeat in the most experienced pilot. Although holding patterns may be used on any instrument flight, holding clearances are issued infrequently enough that pilots can get a little rusty on the procedures. Visualizing a holding pattern from your current position is one of the more challenging aspects of instrument flight. 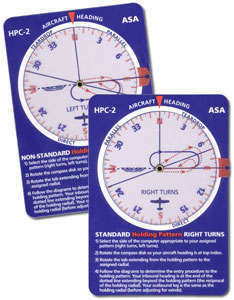 ASA's new design for the Holding Pattern Computer not only displays the appropriate entry procedure given the assigned holding radial for both standard and nonstandard patterns (direct, parallel, or teardrop), but it also depicts how pilots get to this entry, given their current aircraft heading. A perfect learning tool for experienced instrument pilots, students, as well as a convenient instructional aid for flight instructors. Made from durable plastic. 5" x 3 1/2". Review: I have come across a lot of techniques to learn holding pattern entries. Some of them confusing, convoluted, or clumsy. Tried a couple variations of the finger method and at least a couple of other calculators. I finally settled on the 3-step method which is by far the simplest, and closely resembles how this calculator visualizes the holding pattern entry. Compared to other calculators this one is relatively decluttered and speaks to its simplicity. Note: I consider any of these calculators learning tools only - in the cockpit this stuff needs to be ingrained into muscle memory; no fumbling with these devices. Review: I would buy this product again. Review: A very handy tool. Review: Haven't really used it,just feel more comfortable (and trustworthy) of actually drawing out my holds with a pencil and paper. Maybe that will change when I really get proficient at using it, because it is not that self-explanatory. Review: I will give this 4 out of 5 stars because its a bit difficult to operate with one hand, you need two which can be a challenge in IFR. I read the previous reviews, and I dont see how this dont work unless people are using wrong or they updated it, because I went to my instrument ground school book, and looked up the holding entry questions, and this device calcaluted EVERY one of them correctly! its all plastic construction too, so maybe that was upgraded from cardboard. but it works, and even though you gotta get the knack of working the dials physically while in the air, its worth it. this is a must have tool for IFR. it dont fail, its right every time. for the price its a no brainer, buy one now. its easy to understand, set the heading, then rotate the red tab to the holding radial, and the red tab is residing in one of the 3 zones, parellel, teardrop, or direct. simple, and easy. no muss, no fuss. Cons: Cheap aspect, does not rotate easily. Cons: its a bit difficult to move the wheels at first, but you get the hang of it. Q: is this computer a permitted aid for a FAA Instrument Knowledge exam? A: In FAA Advisory Circular AC 60-11C, Section 5c leaves it up to the individual testing site to determine if this would be allowed.